It was the lines that got me. I’ve passed this way so many times, but for some reason the strongly oppositional vertical and horizontal lines had never presented themselves so starkly before. So I had to get out my phone and take a photo. Both buildings are part of the old Val. (with a period 🙂 ) Blatz Brewing Company, but each represents a vastly different era. The building on the right is the older of the two, obviously. It was built in 1901. The newer building was built in 1946. 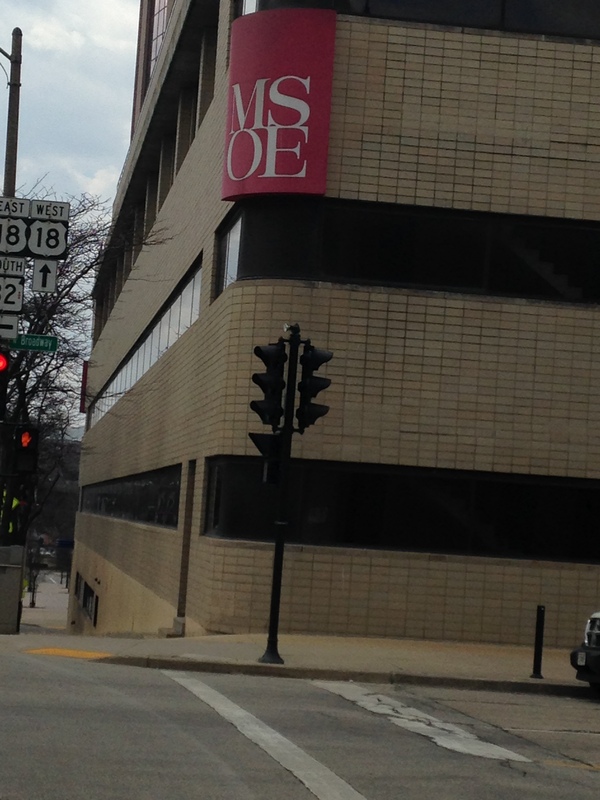 MSOE’s Great Books Dinner & Discussion evenings are held in the former company offices of the Val. 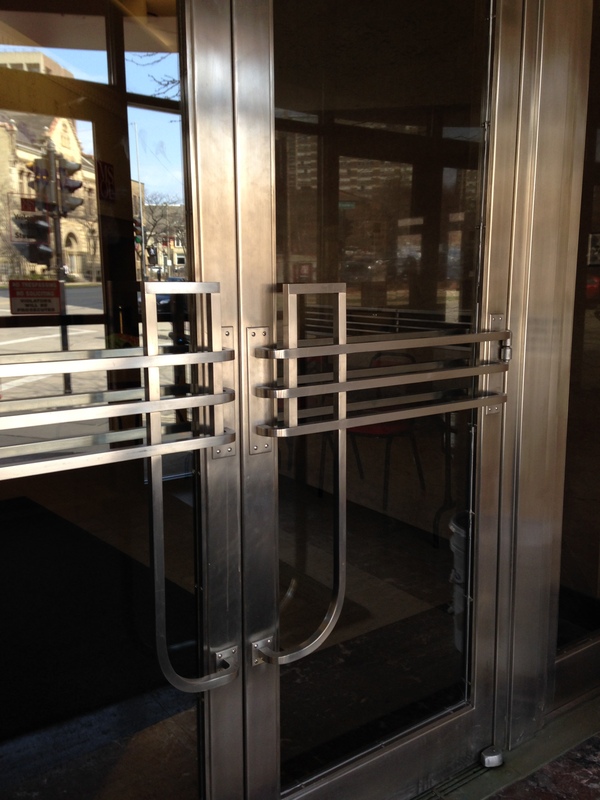 Blatz Brewing Company, now MSOE’s (Milwaukee School of Engineering) Alumni Partnership Center. 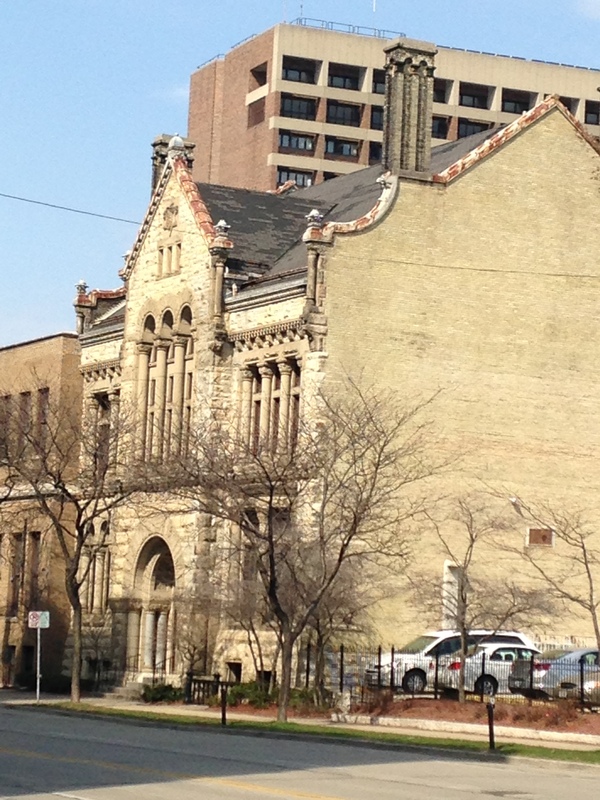 Below is another photo of the Alumni Partnership Center, drawn from the Historic Photo Collection in the F. P. Zeidler Humanities Room (Frank Zeidler was mayor of Milwaukee in the mid-twentieth century) of the Milwaukee Public Library’s digital archive (view the full-sized version here). This photo, taken back when the building was the Blatz Brewing Company General Offices, is labeled “pre-1960″—and certainly looks it! 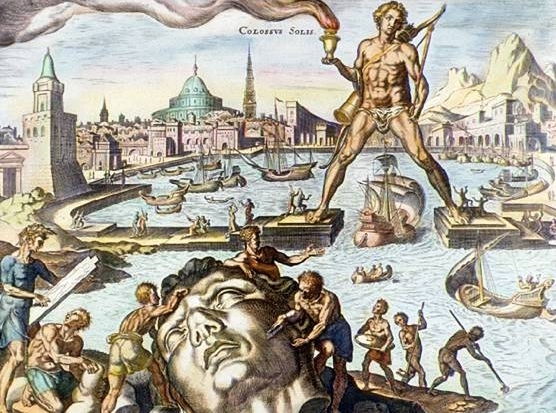 And check out this photo (again, view the full-sized version here in the Milwaukee Public Library’s collection). Arches towering over Broadway mark the entrance into the Blatz Brewing complex. No traffic whatsoever in this photo except for three horse-drawn wagons showing up teeny-tiny in this photo, in the middle of the center and right arches, on what is now a very busy street! The dates on either side of the words “Val. 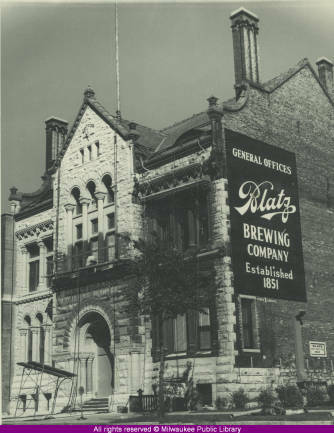 Blatz Brewing Company” are 1845 and 1895—so the arches would have marked the company’s 50th anniversary. Can you make out the six-pointed star right under the “B” of the “Val. 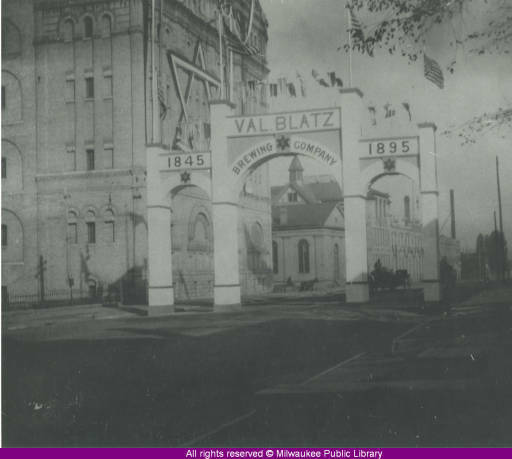 Blatz” name at the top center of the archway? There’s also a gigantic version of that star on the front of the building behind the archway. I noticed this same kind of star on one of the historic Miller Brewing buildings the other day as I drove through Miller Valley. Then I wondered if maybe Frederick Miller had been Jewish and thus put the Star of David on his building. I snapped the pictures below of the newer Blatz building (the one on the left in the first photo in today’s post) while waiting for the traffic light to change at the corner of State and Broadway. Don’t you love the aerodynamic sweep? I’ve always felt a kinship with this building. When I moved to Milwaukee in the early 1980s, I think it was owned by Pabst, another now-defunct Milwaukee brewery. At that time it was one of the most striking buildings I’d ever seen, very Art Deco/Moderne —as seen in Airstream trailers and streamlined 1930s automobiles and not to mention the Milwaukee Road’s Hiawatha) —with parallel tubes of purple neon lighting that wrapped around the rounded corners and emphasized the building’s curved lines. At night it glowed like a beautiful alien spaceship. 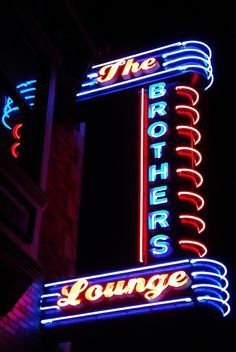 This image I found on Pinterest of The Brothers Lounge in Cleveland comes closest to approximating the look. Thirty-some years ago I used to change my driving route deliberately in order to go past this building. That’s how much joy I got from seeing it. And now I teach here several times a week and walk past and through it every day. Life is certainly surprising in its concentricity! I had to search for quite a while to discover when the building went up. I never did find an official opening date, but I did find this photograph in the Milwaukee Public Library’s collection. You can view the original here. 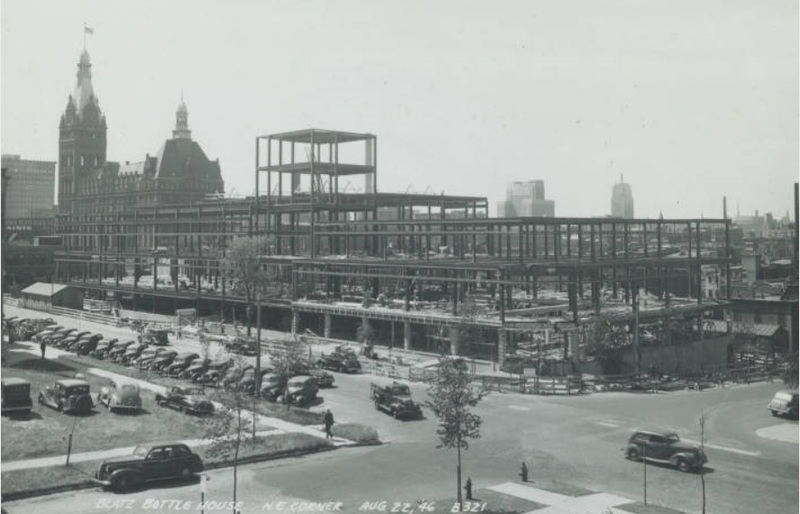 The photo, dated August 22, 1946, shows the Blatz Brewery Bottle House under construction (that’s City Hall in the background). 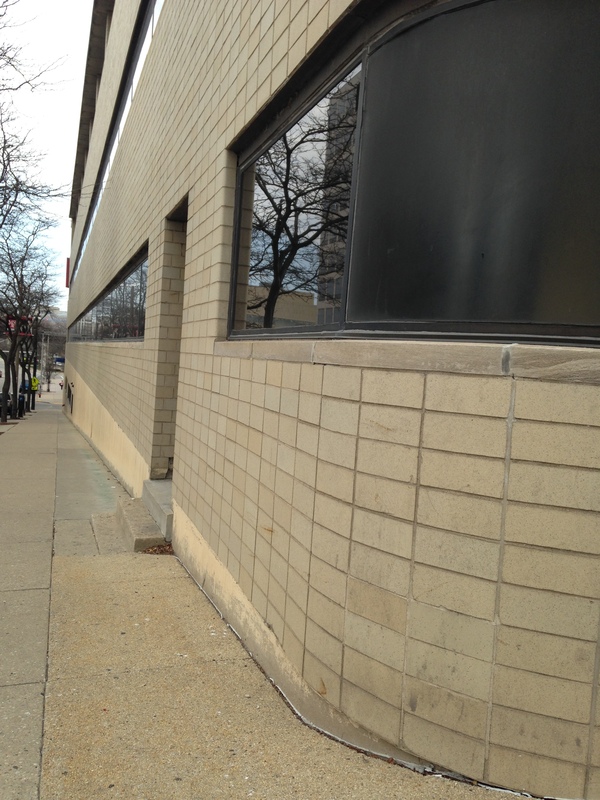 Here is the same building today (now MSOE’s Campus Center) from a similar vantage point but shot from a lower angle. Although the building has been updated and adapted for use as a university facility, it still contains many of its original features. 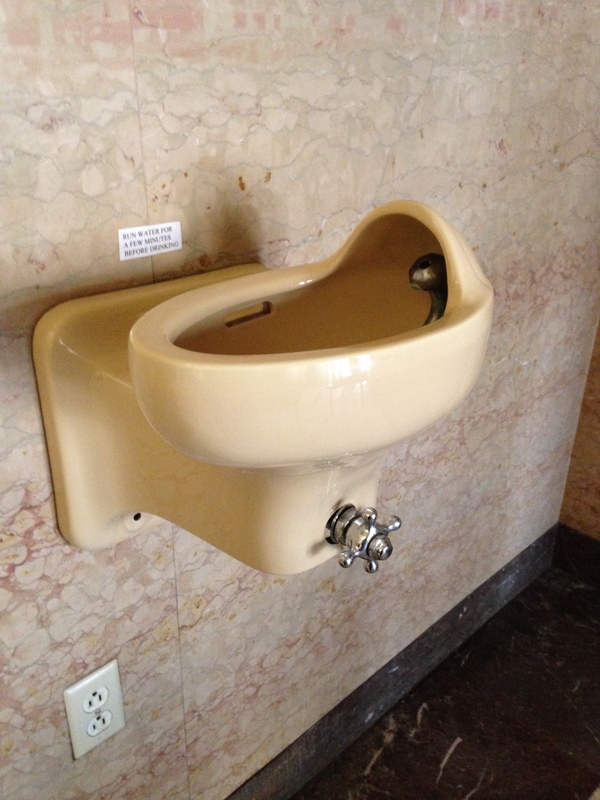 For example, this drinking fountain, with a note that you should let the water run a few minutes before drinking—presumably because it’s been sitting in old lead pipes. And this mural. 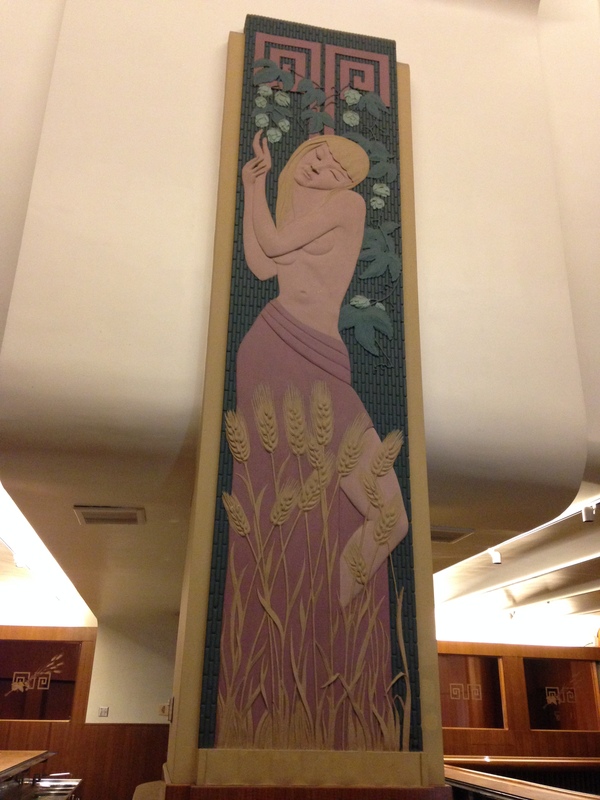 In keeping with the “beer” theme of the building, those are hops hanging down from the top and stalks of barley on the bottom. 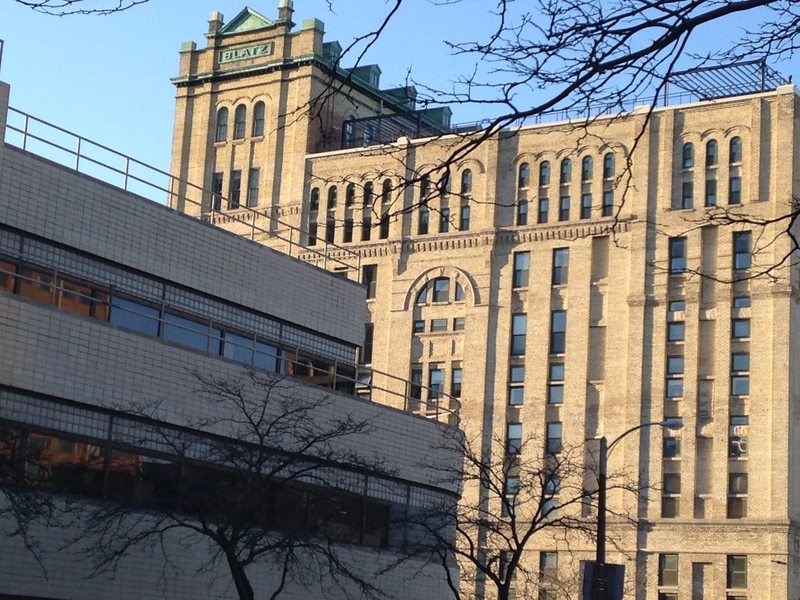 This entry was posted in architecture, History, Milwaukee, Photography and tagged Art Moderne, Blatz Brewing Bottle House, Blatz General Company Offices, Downtown Milwaukee, Milwaukee School of Engineering, Val. Blatz Brewing Company. Bookmark the permalink. Great post and very interesting. I love the history and the visuals and forgotten about Blatz until you mentioned it. I was born in Milwaukee but left at the age of three. I have been as an adult and really liked the city, especially the architecture. Your discussion on that book sounds fascinating. I have been meaning to read it as a follow-up to Mad Men. I think you’ll enjoy the book. It gave me so many small insights into that postwar era that I’d never known before. What a great post. I learned a lot and enjoyed the gorgeous photos!